Holderness, NH – On a cold and cloudy day in early March, a group of 12 veterans joined educators at Squam Lakes Natural Science Center in the early hours of the morning. The sun was not up yet as they reviewed lake depth charts and talked about water quality and underwater rock formations. They were on a mission for lake trout. The veterans were with The Fallen Outdoors, a non-profit volunteer organization established to facilitate hunting and fishing trips for veterans throughout the country. Squam Lakes Natural Science Center was leading them on an ice fishing expedition to catch lake trout on Lake Winnipesaukee. Arriving on the ice shortly after sunrise, the group began drilling holes into the two-foot thick ice, setting tip-ups and preparing jigs. 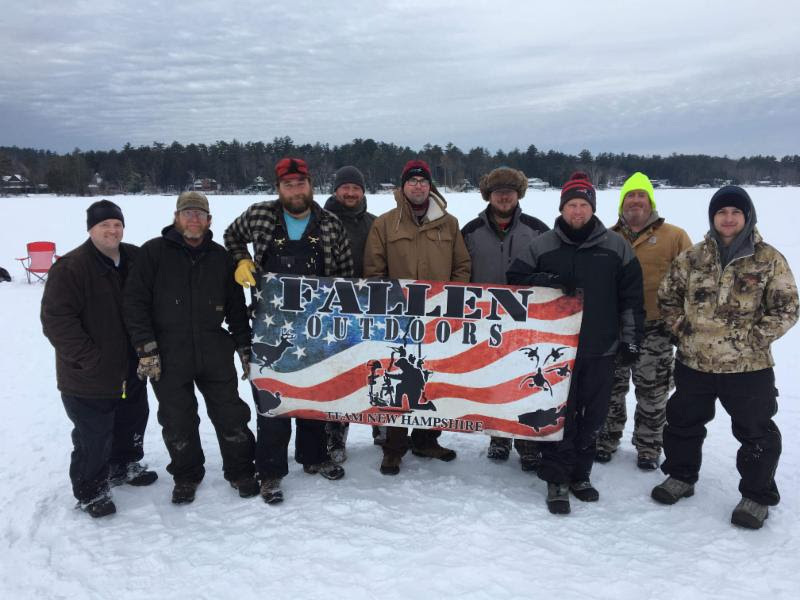 The Fallen Outdoors program started with a simple idea to get veterans outdoors. They aim to connect veterans from all military branches to a network that will serve them locally and nationally. The program provides a social bond and conversation between veterans that only they can share, having been through similar events. The group fished until well after lunchtime and even had success with a lake trout and burbot catch. Learn more about programs at Squam Lakes Natural Science Center at www.nhnature.org/programs. Learn about The Fallen Outdoors at http://thefallenoutdoors.com/. The mission of Squam Lakes Natural Science Center is to advance understanding of ecology by exploring New Hampshire’s natural world. Through spectacular live animal exhibits, natural science education programs, guided Squam Lake Cruises, an informal public garden, and Blue Heron School, a nature-based Montessori early learning center, the Science Center has educated and enlightened visitors since 1966 about the importance of our natural world. Squam Lakes Natural Science Center is located on Route 113 in Holderness, an easy drive from exit 24 off I-93, and public trails are open daily from May 1 through November 1 with programming throughout the year. The Science Center is accredited by the Association of Zoos and Aquariums (AZA) and is the only AZA-accredited institution in all of northern New England. For further information about the Science Center, call 603-968-7194 or visit www.nhnature.org.